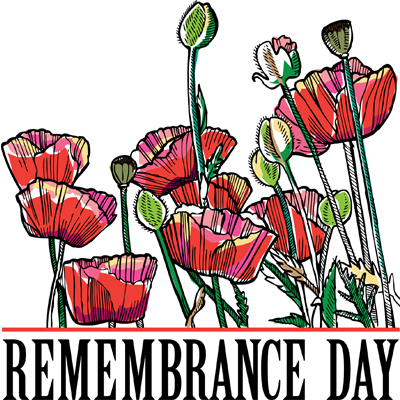 It’s that silence in our observance of Remembrance Day that fills in the spaces in between, and reminds us that silence can be a powerful observance and sign of gratitude that we can offer. Silence calls us to contemplate the power of words, the importance of peace, and our frequent inability as human beings to seek a common good. Jesus says, seek this common good, as you love one another as I have loved you. For it is love which connects us, not hatred. It is love that propelled young men and women to cross field and sea to serve and defend. Motivated by love of friend and neighbour, family and nation, motivated by duty and these words of John 15, they laid down their lives. Families were irrevocably transformed by the lives of those who served. If they died, they died martyrs. If they lived, they carried with them stories too painful to share, haunted by death. We’ve come to better appreciate today, the struggles that war has upon the minds and hearts of those who served. For these demonstrations of love and service did not come without a cost. We cannot diminish the truth of this statement, because an entire faith was created around one person’s demonstration of love. Jesus died, so that his friends might be saved. While we tend to think of the cross as punishment and devastation, it is truly the sign of love made manifest for Jesus’ disciples. It wasn’t difficult to become an enemy of the state when you preached compassion for all, grace above (religious) laws, and love and service to God, not the emperor. Jesus must have felt those shadows circling around them. We have countless stories of Jesus antagonizing local authorities that he must have been able to sense what was coming. In the story of Jesus last moments, he gives up, gives in, gives over his life so willingly. I always thought that strange until I held that scene to the light of this scripture. Jesus lays down his life for his friends, because while he was certainly the target of hatred, the disciples were just as recognizable. We know this as we see Peter warming himself over the fire. There he was named as a follower of Jesus. In his fear, he denied even knowing Jesus. The culture had grown suspicious of all those who sought to live a different way, and as a result, the followers of ‘the Way’ of Jesus were at as much risk as Jesus himself. Jesus offered his life so that others may live. In Mel Gibson’s latest directorial outing, Hacksaw Ridge, he sought to tell the true story of Desmond Doss, a medic in WWII. The story follows of Doss’ heroism during the battle of Okinawa as a conscientious objector, refusing to carry a weapon because of his faith. While the scripture commandment of ‘thou shalt not kill’ comes to weigh heavily on Doss’ soul, these words from John are put into action as Doss sought to save both friend and enemy alike. It was a powerful film. It reminded me how countercultural this notion of loving one another is, and how one could envision another way to lay down one’s life for one’s friends. The movie showcased Doss’ deep unswerving beliefs as a Seventh Day Adventist, and his pursuit to put a little bit of the world back together… while it sought to tear itself apart…, but what I found stuck with me, was the profound level of violence. I know…it makes sense in a movie about war to show destruction, even death. But this movie was a painful reminder the devastation we wrought upon one another. There were moments I had to look away. And rightly so. War has become trivialized into video games, it is being lost to history as our veterans age, and we run the risk of forgetting (or diminishing) the sacrifices that have allowed you and I to live in peace. And in the wars that have followed WWII (as it was featured in this movie), in Korea, Afghanistan, places named and not named, known and not known, women and men have laid down their lives in service of their friends, their families, their nation, so that peace may prevail. And still today, women and men serve to ensure you and I may dwell in peace. Remembrance Day is the reminder that this will never end. I pray that we may dwell in this peace for as long as we can, but it takes you and I telling the story, again and again. That there is a cost to peace, whether it is the sacrifice of our own lives, or the sacrifice of our words, our safety, our standing, we lay down that which is ours so that others may live. There is a cost, as we seek to win silent wars won by drones and innocents caught in the crossfire. There is a cost to care for our Veterans as they age. There is a cost as we live without thought to our own safety, day in and day out. This is why I offer this poem by Thomas A. McClure, entitled, The Cost of Peace..
Of frightened men about to die. Chiseled names on a granite slab. Is the ghost of stories that the old men tell. What price is there to keep at peace? And the fragile world remains at rest. I thought this was a very meaningful Remembrance service and I’m sure I wasn’t the only member of the congregation who found the anthem Prayer of the Children deeply moving. Thank you Alison, thank you choir and thank you Chris.